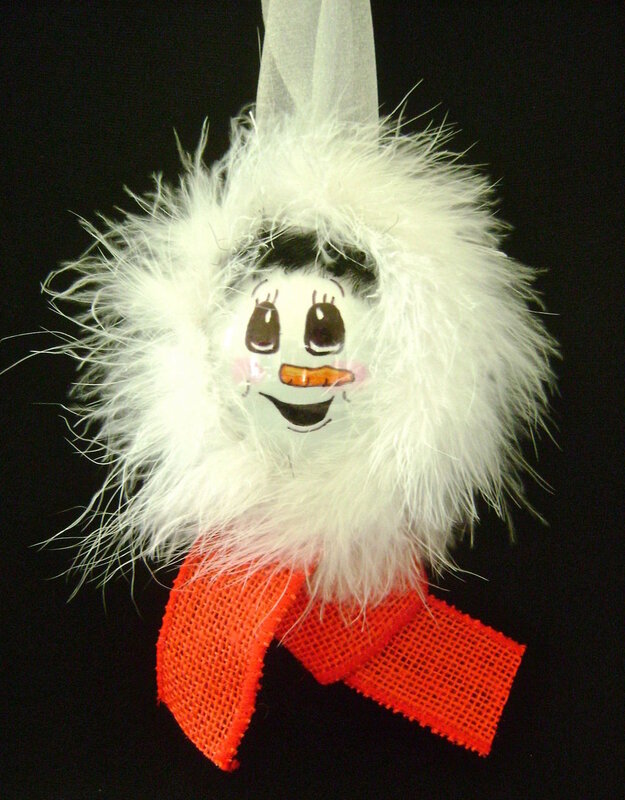 A fur hood and wool scarf make this snow girl ornament a treasure. Start with any size burned out light bulb, add a face with markers, a little doll hair, a piece of craft boa, and wired, woven ribbon for the scarf. This is the kind of gift you can create at the last minute because it comes together so quickly. step 1 - To keep the bulb from rolling around, cradle it in soft thick fabric, like fleece. Use a thin, black Sharpie to draw the eyes. Start with the outline of the eyes, then fill in with thicker marker. Don’t worry about making mistakes. Any errors can be wiped away with a Q-tip dipped in rubbing alcohol. step 2 - Draw a black outline for the carrot nose. step 3 - Fill in the outline with an orange marker. Draw a yellow maker across the top of the nose to create definition. Add small black lines on the underside of the carrot. step 4 - To draw the mouth, begin with the top line. step 5 - Shape the bottom of the mouth by extending from the top line. Use the fine black marker to add details to the corners of the mouth, eyelashes and eyebrows. Create rosy cheeks with a pink marker. step 6 - Apply hot glue in a line across the top of the head then drape doll hair across the glue line. Don’t worry about the hair length. Trim the hair once it is in place and secured to the glue. step 7 - Apply hot glue around the face edges and across the bottom of the bulb and press the fur to the glue. Cut off excess fur. step 8 - Tie the ribbon, leaving an opening the size of the bulb base. step 9 - Insert the bulb into the ribbon. Place hot glue on the center back of the ribbon edge and hold it against the center back of the bulb. Work your way around the scarf gluing it to the bulb. Make a loop in a piece of sheer ribbon and tie a knot. Cut off the tails. Hot glue the knot to the center top of the ornament, hidden behind the fur.